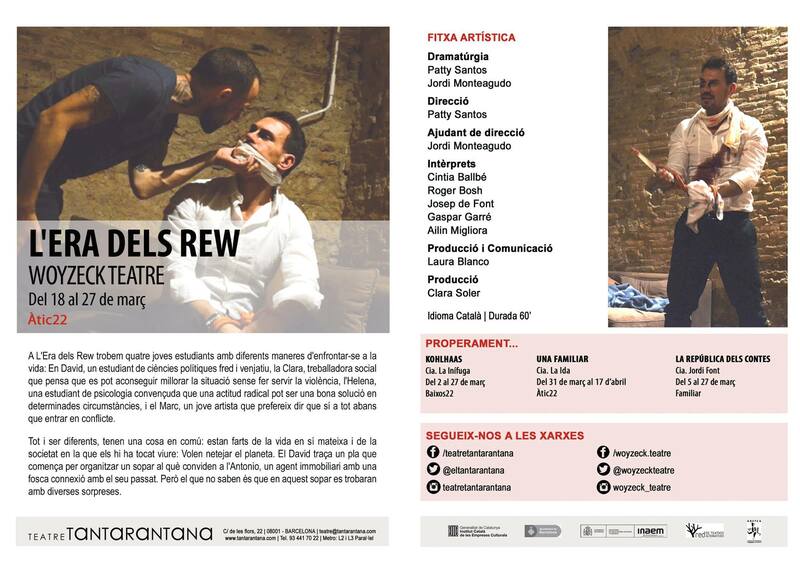 Production and communication design for the theater play L’Era dels Rew from Woyzeck Teatre. Four students with different approaches to life: David, a political science student cold and vindictive, Clara, a social worker that believes in changing the situation without the use of violence, Helena, a psychologist student that trust in the use of force sometimes and Marc, a young artist that avoids confrontation by saying yes to everything. They are different but have something in common: they’re sick of the life itself and the society where they live in. They want to clean the planet. David thinks of a plan that starts with a supper with Antonio, an estate agent with a dark connection with their past. What they don’t know is the surprises awaiting for them in this lovely date. The main work was to gather all the information of the project, shape it in the different visual formats and handle the productions aspects such as the rehearsal rooms, dealing with different theatres, prepare the communication material, handle social network and budget. As a result, the play got a good public reception, with a few performances with sold out tickets. The official release was made in the Àtic22 (Tantarantana theatre), and two months before it could be seen a few weeks in The Collective too.